Ultimate travel coffee setup or cry for help? You decide. It wasn’t long ago that the word obsession conjured up much more negative connotations in society. Today obsession is practically treated like a virtue — something to aspire to — and it can apply to something as neurotically trivial as the cup of coffee you drink when you are traveling. So when does obsession go from a cute hobby to seek out the “perfect” coffee to a Sisyphean road to Lithium treatment? One unhealthy sign is when you’re carrying a suitcase dedicated to your home coffee. A big reason why we’ve been quiet around here of late is that we recently spent a few weeks traveling in the remote Portuguese archipelago of the Azores. In particular, we spent the bulk of our time on the sleepy island of São Jorge — where, on an island about twice the size of San Francisco, there are less than 10,000 residents, more than twice as many cows, and Internet access barely exists beyond its tiny airport. This recent example illustrates what’s lost when people insist on taking their lives with them everywhere. What happened to the joy of discovery in travel? Why go to places like the Azores to ensure that you have your daily supply of Chipotle burritos and Intelligentsia coffee? Why demand the same exact dining experiences you can get back home in your suburban backyard? Call it the “When in Rome, why seek out an Olive Garden?” rule. Yes, a lot of coffee in the American backwoods, and the rest of the world, is terrible. But with a little research with this thing called the Internet, you can actually learn something new in the process. I may have stumbled on some of the most foul and unrecognizable coffee in the world when I was traveling outside of Prague’s Vyšehrad back in 1995 — it was like large-grit sawdust suspended in boiling water. But the fact is I can still remember that experience. Fondly even (albeit comically). That’s more than I can say for the hundreds of Intelligentsia shots I’ve had over the years. But set aside any xenophobia diagnoses for a moment. Obsession over coffee travel setups also raises the question of whether these people actually like coffee to begin with. For example, we could argue that the author of the Boing Boing article doesn’t really like coffee. Because when the only coffee you can tolerate is a very specific kind made a very specific way, reduced to an obsessed miniature slice of the wide spectrum of experiences that coffee has to offer, it’s only that tiny bit that you actually enjoy. And that’s not coffee — that’s some other craving you’re feeding. Now whether you’re the parent of a newborn or of a teenager with a driver’s license, we’ve often liked the no-nonsense, fad-skeptical coffee articles published by the Seattle Weekly. Today’s piece explores the importance of coffee grinders: The 2010 Grinder Smackdown: Coffee Gets Combative – Seattle Restaurants and Dining – Voracious. Comparing a La Marzocco Swift grinder and a Mahlkönig K30 Vario, the author discovers how much the choice of grinder can influence the quality and properties of the resulting espresso shot. 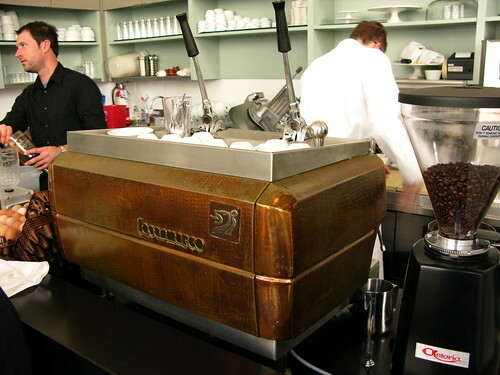 We’ve always emphasized how a solid grinder is often more important than the quality of your espresso machine. Opening in Oct. 2009, James Freeman finally established a spacious company headquarters home for his ever-growing Bay Area coffee empire here in Jack London Square. They host a surprisingly small café for retail coffee service. There’s several tall stools and tables for outdoor seating along Webster St., and indoors there is barely a four-person window counter to sit at. Much of the space is dedicated to specialized operations such as warehousing equipment and supplies, larger batch roasting (with two large Probat roasters), daily cuppings (every day at 2pm), making baked goods for all of their outlets, barista training, and desks for buyers and all the other administrative details. This location is part coffee lab, given the test roasts and equipment trials they perform here, but also part museum — the latter reflecting Mr. Freeman’s enthusiasm for older equipment and electronics. His blending of the two seems to put the recent media obsession with gadgetizing coffee and emphasizing coffee “firsts” in a rather conflicted state. Coffee so fresh, it’s from the future! Now juxtapose this fetish with Mr. Freeman’s obvious infatuation with things like the 1940s Altec Lansing “Voice of the Theatre” speakers at this location, an old Russian projector scope for internal office presentations, vintage stereo equipment in the barista training room, and a dual-lever La San Marco machine at the Mint Plaza Blue Bottle Cafe — nostalgically, Blue Bottle’s first espresso machine and it’s still in service for single origin coffees. Good luck geeking out on the bleeding-edge technology news in all that. The facility emphasizes transparency: large glass panes with visibility inside Blue Bottle’s various operations. Combined with their roasting and training facilities, this makes Blue Bottle’s headquarters perhaps the closest Bay Area equivalent we have to Cape Town’s Origin Coffee Roasting complex — just with all the Cal/OSHA regulations thrown in so that transparency here means “look, but don’t touch”. The retail coffee bar may be small at this location, but it’s capable of great things with its “oh so last year, honey” three-group La Marzocco Linea machine. The resulting shot is extra potent and short without being overly syrupy. It has a textured, richer medium brown crema and a smooth, rounded, fresh-tasting, flavorful pungency of thyme, some pepper, and traces of smoke, honey, and cedar. An outstanding shot. Served in classic brown Nuova Point cups. Read the review of the Blue Bottle Coffee Company in Oakland‘s Jack London Square.